Discussion in 'Online Casino Promotions' started by Ellis, Apr 3, 2015. Claim a 30% Friday Deposit Bonus at Klaver Casino! newly released Spinata Grande Slot! If you like to play for real money, then Klaver casino has a nice bonus offer to take advantage of. 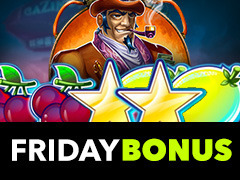 All existing players that made at least one deposit can take advantage of a special Friday Bonus of 30%! This wonderful bonus offer is valid on your deposit up to €100! They only thing you need to do, is login to your casino software and make a deposit of up to €100. After that your Bonus amount will be credited immediately. At the webpage of Klaver casino you can find more details about this offer and remember it is only valid today on Friday April 03, 2015. If you are an new player at Klaver Casino, then I have some great news for you! There is a 100% bonus waiting for you to be claimed! This new player bonus is valid on your next deposit of up to €150! If you are looking for something different? Try out Klaver casino and you will be amazed by all they have on offer. Visit Klaver Casino now and Try your luck with your 30% Bonus! Good Luck everyone at Klaver Casino!